At the Interactive Aquarium Cancún you will discover a unique way to interact with marine invertebrates in the touch tanks area. Here visitors can carefully see and touch the echinoderms: starfish, sea urchins and sea cucumbers. The Asteroidea class is composed of around 1,800 existing species that are distributed around the world's oceans, including the Atlantic, Pacific, Indian, Arctic and Antarctic. They generally have a central disc and five arms, although some species can have many more arms. They have tube feet that are operated by a hydraulic system and a mouth at the center of the oral surface or lower part of the surface. For many years, these starfish have been dried or painted with bright colors to be sold on the beach as decorative objects. As a result, they are now considered as a rare species in some places where it used to be common to find them. They are found in waters from 0 to 69 meters deep. Diet: Omnivore. 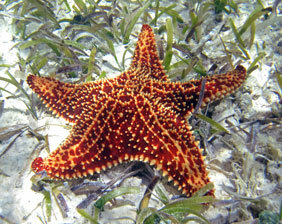 Starfish feed on a wide variety of organisms such as sea urchins, fish, worms, grubs, micro algae, etc. Size: They can grow up to 50 centimeters. Fun Fact: Starfish are able to regenerate amputated limbs. These animals have an elongated body, they can measure between 2.5 and 180 centimeters and their diameter is around 25 centimeters. The sea cucumber lives in shallow salty waters around coral reefs. Its skin can be brown, black or olive green, with bone particles and a leathery texture. Diet: Detritivores and omnivores, sea cucumbers consume sediment and organic debris with the tentacles around their mouth. 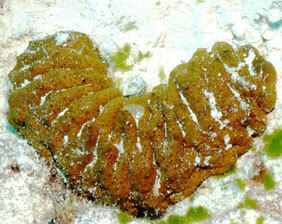 Size: Many sea cucumber species measure around 180 cm in length; the smallest holothurias do not exceed 3 cm. Fun Fact: It can process around 120 grams of sediment per day, which represents 44 kilograms per year. Its black or dark purple body is densely covered with short white thorns. It lives in beds of seagrass and occasionally in shallow reefs where it often covers itself with leaves and other debris. In some places, its roe is used in gourmet dishes. Diet: Seagrass or algae embedded in rocks. 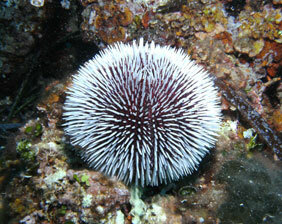 Size: A sea urchin can reach up to 15cm in length. Fun Fact: The thorns on the urchins are used as a defense mechanism.